June 28-30 with distinguished speakers including José Manuel Silva Rodríguez DG Research for the European Commission. The Innaxis Foundation & Research Institute will be sponsoring a conference at the Universidad Internacional Menéndez Pelayo from the 28-30 of June. Along with the conference, Innaxis is also promoting the opportunity to be given a scholarship for a summer course. Information and registration can be found here. ending with a concluding theme of Innovation and Financing. The conference will be sure to cover an interesting array of perspectives as the Director of the conference will be José Manuel Silva Rodríguez, the Director General of Research for the European Commission. Antonio Giralt, President of Mercado Alternativo Bursátil (MAB). For those that would like to attend the conference, please visit this page and then click on the link on the top right titled ´Matrícula / Beca / Pago on-line ´ . If you are not a registered user of the UIMP, registration is fast and easy and furthermore open to all. Invited speaker Francisco Ros- Spain’s Secretary of State for Telecommunications and the Information Society talks about the potentials of the technological sector for economy growth. The economic situation is on everyone´s mind lately and more so in formal colloquiums such as the ones that are hosted by The Euroamerica Foundation. These events present an opportunity to hear certain personalities from the fields of science, politics, economy, and diplomacy and their reflections about the current situation in their field. Innaxis sponsored the December colloquium in which Francisco Ros, Spain´s Secretary for Telecommunications and the Information Society, was invited to speak. He states that the Information Technology sector has increased by 16% in revenue, or 114 billion euros. Francisco Ros also points out that within this growing industry a direct employee can generate between 6 and 7 induced jobs. Furthermore between 2005 and 2008, employment grew to 7.2%, encouraging growth in influencing economic sectors. This sector has much importance on the economic growth both on a national and international level. In regards to growth on a national level, Francisco Ros talks about a few opportunities that should be taken advantage of especially during the Spanish presidency of the European Union that will be starting in January 2010. 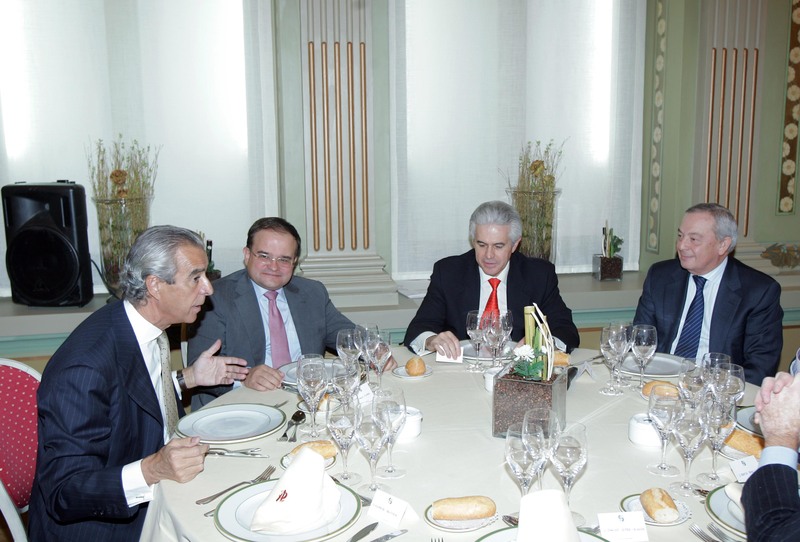 Below you can find a picture with Innaxis president Carlos Álvarez with Francisco Ros as well as Carlos Solchaga,President of the Euroamerica Foundation. President of Microsoft Spain presents her thoughts at Innaxis sponsored EuroAmerica colloquium. 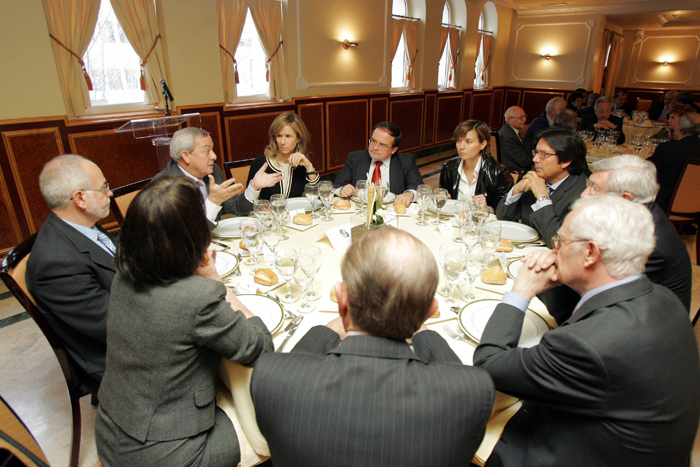 On November 19, 2009 María Garaña, President of Microsoft Spain, presented her thoughts on how Spain can overcome the crisis. Compared to the rest of Europe, Spain has been hit with the hardest of the economic crisis. Unemployment rates are at 19.3% according to Eurostat, and Zapatero just announced a tax increase. It´s no surprise that consumer confidence is still at a low 45,1% compared to 76,1% just two years ago, and 84,5% in 2006 according to the data provided by the ¨Instituto de Crédito Oficial¨. 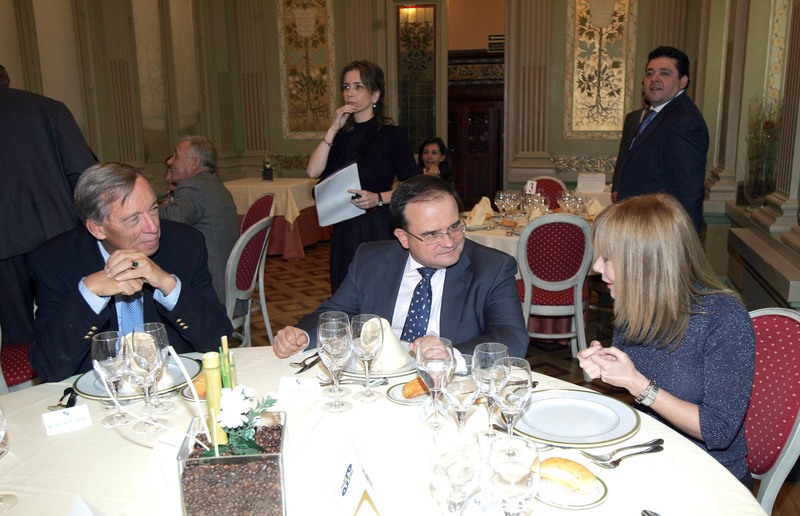 Garaña was invited to speak at the EuroAmerica November colloquium about Spain´s economic situation. During her presentation, she talks about three priorities Spain should have in order to try to get out of the crisis. 1. Encourage the formation of small and medium companies in the information technology industry. 2. Create incentives for young students that would like to study a technical career field and furthermore support young entrepreneurs that are trying to make their dreams a reality. 3. Lastly, encourage alliances between public administrations and private companies to create synergies. Stimulating the cooperation and understanding is a popular objective, not only in the country of Spain but also Spain´s international relations. The EuroAmerica Foundation´s primary objective is to stimulate cooperation and understanding between European and Latin American institutions, companies and personalities. Innaxis as well, holds a similar vision, to act as a catalyst which makes possible the emergence of relevant, ambitious and interdisciplinary ideas and projects. The Innaxis Foundation & Research Institute has been in close ties with The EuroAmerica Foundation, sponsoring a different event with the Minister of Science and Innovation as the invited speaker. Below are pictures from the event. Innaxis continues to share this ´catalyzing´ objective with EuroAmerica and will also be sponsoring the next colloquium. Innaxis had the pleasure of sponsoring another roundtable event held by Euroamérica. Euroamérica is an independent, non-profit organisation whose principle objective is to stimulate the cooperation and the understanding between insitutions, businesses, and other European and Latin American personalities, for the promotion of a relationship between Europe and America. The Minister of Science and Innovation was invited to speak at this event. She spoke about the major investment that will be put in R&D in order to beat the national crisis. For this, she talks about the supplement of the investment that will be put into R+D+i. On top of the already decided amount, there will be additional resources of 490 million euros destined to go to the ´Plan Español´ for the economic stimulus and ¨to strengthen the thread that holds the productivity of our country¨. As solutions such as launching sun-reflected mirrors into space become a consideration, the unforeseen consequences might be worse than the initial problem of global warming itself. Engineering ethics applies as well to technologies, especially with the amount of complexity involved, the potential effects may turn out to be unethical. In fact, some researchers and scientists are even considering holding a conference to discuss the possible effects of future technologies. Taking a look at it from a complexity science point of view may prevent future technologies from entering ethically challenging territory. Complexity science is a growing field of study used in a variety of areas. Transport systems, financial markets, biological processes- all can be studied from the angle of complexity science. All areas involve a large number of independent elements that when put in action or combined produces an emergent behaviour, some of which may be unpredictable or even cause chaotic evolution. Analyzing the environmental effects from future technology developments might be useful from a holistic perspective. Applying complexity science methods to these considerable solutions may be a way to tell the future before actually taking the chance. The problem is how to organize such a conference, as only one has been held in the past- the Asilomar conference in California to develop an ethical framework that still prevails in biotechnology.